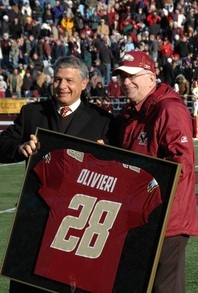 Dr. Olivieri was the Director of Sports Video Production for the university and the Athletic Department 28 years. This involved co-ordinating all activities related to the large video format screens in the athletic complex (two in Alumni Stadium, and 2 in Conte Forum). The events included all football, men’s hockey, women’s hockey, men’s basketball, and women’s basketball games. This included event management, applications development, digital video creation, statistical analysis, and video production. In addition, it involved production and/or assistance at a variety of non-sporting events such as University Commencement, Convocations, Church in the 21st Century, POPS on the Heights, and Campus School Benefits, just to name a few. In the role of Director, he taught, mentored, and managed 10-12 students who learned all aspects of digital video production in a hands on environment. They provided all the camera work, replays, audio and graphics for home sporting events. He also was intimately involved in the design and selection of several video boards and supporting equipment in Conte Forum. Further, Dr. Olivieri worked closely with the university’s coaching staffs to explore ways in which technology might improve the performance of an athlete, coach or team. He did all this while also serving as a full time member of the Information Systems Department in the Carroll School of Management. In 2011, he was elected to the Boston College Athletics Hall of Fame for his contributions to Athletics in the use of video and computer technology in sports. The Batter’s Edge was a “state of the art” system that was developed for the Boston Red Sox (in the early 1990’s, well before current systems) that tracked every pitch thrown to a Red Sox batter and recorded it to laserdisc along with a large variety of statistical information about the player’s at bat. Players used this system at home and on the road to improve their performance against opponents. This was the first application of computer and video technology in Major League baseball and was featured on “This Week in Baseball” on national television. Dr. Olivieri was a technology consultant to the Boston Red Sox from 1987 until 2002. His work involved integrating technology into the Boston Red Sox Media Guide, as well as assisting with game production in the Video Control Room. During spring draft meetings he utilized technology to assist coaches and scouts in evaluating and tracking potential players. Created a “helmet-cam” to be worn by a quarterback during practice. The objective was to create an interactive computer based application that would help a quarterback learn how to “read” an opponent’s defensive formations. Developed “Game Plan”, a laptop based system for coaches to use live, during a football game, to determine if an opponent was adhering to the “game plan” developed by the coaching staff in preparation for the game. Created a large number of highlight videos and DVDs for basketball and hockey teams.